You’ve heard home care is too expensive. There are ways even if you do not have the money! You’ve heard it is expensive. You cannot afford this care or are not healthy enough to purchase Long-Term Care insurance. Perhaps you tried to purchase insurance but were turned down. 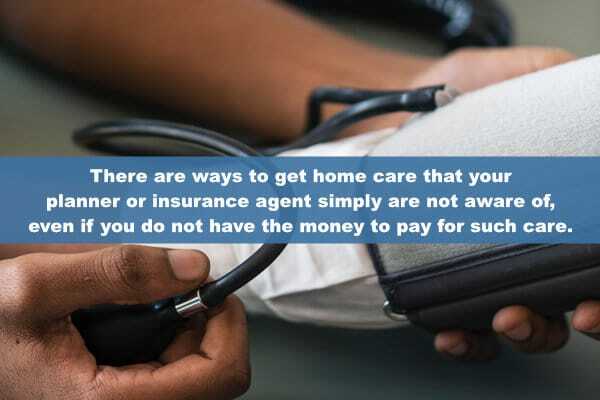 There are ways to get home care that your planner or insurance agent simply are not aware of, even if you do not have the money to pay for such care. First, let’s look at what happens to most people. They need care and look into moving to an assisted living facility. Without the ability to pay for the rest of your life, many will say no and direct you to the dreaded nursing home who has to take you on the government welfare program called Medicaid. Assisted living does not have to accept this as they lose money on its meager reimbursement. It seems like your only choices is to move into the nursing home, and sell your house and car and spend down all your money to less than $2000, and cash in your life insurance to qualify for Medicaid. Bummer! Instead of selling your house and finding that only a nursing home will accept you on Medicaid, why not use your house to keep you at home? If the choice is to sell your house and end up broke, then why not consider a reverse mortgage on the house to get the money to pay for home care and stay home? Browse www.TheLongTermCareGuy.com for a wealth of information on LTCi and Call (920) 884-3030 to talk to Romeo and investigate what options might be available for you. The discussion costs you nothing. Bring your children or trusted advisor and see if you can age in place in your own home instead of going broke and ending up in a nursing home.